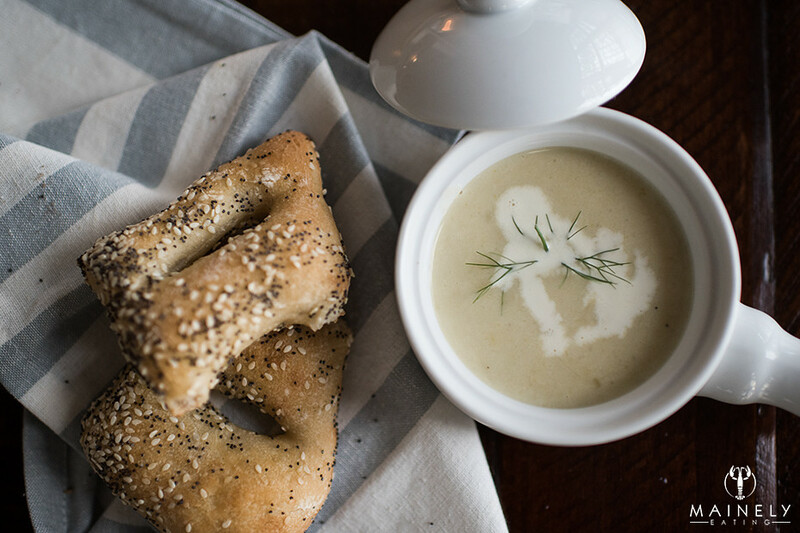 Potato Leek Soup. Or Leek and Potato Soup. When I was planning my move from the UK to the UK, one of the things I barely gave any thought to was the language, after all we all speak English, right? It was only after I moved here I came to appreciate some of the small but significant differences in pronunciation and even names for things. It’s particularly obvious in food. I quickly adapted to oREGano vs oreGANO, dropping the “h” in herbs to say urbs still feels kind of weird and I learned to ask for cilantro rather than coriander in the supermarket. Don’t get me started on the different classifications of sugar – powdered vs. icing, superfine vs. caster…maybe that’s why I don’t bake. Only recently did I start to wonder about why leek and potato soup (as it’s commonly known in the UK) is usually named Potato Leek soup in the US. I suspect it’s because potatoes are more popular than the humble leek and usually recipes call for almost equal quantities of the two key ingredients. 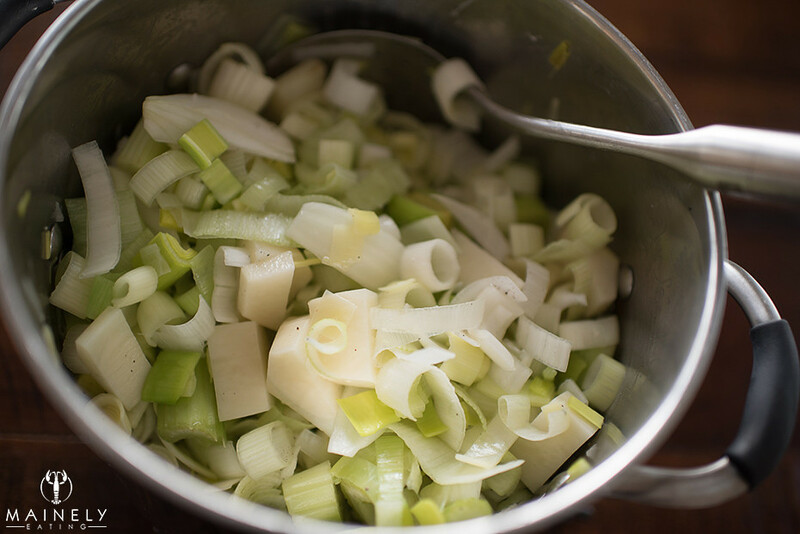 In a large pan, cook chopped, washed leeks and potato with a little butter for about 10 minutes, stirring frequently. Add a good pinch of salt. Add liquid (water or broth) to just cover leeks and potato. Simmer for ~30 minutes until leeks are tender and potato is cooked through. Blend. Stir in cream. Season. 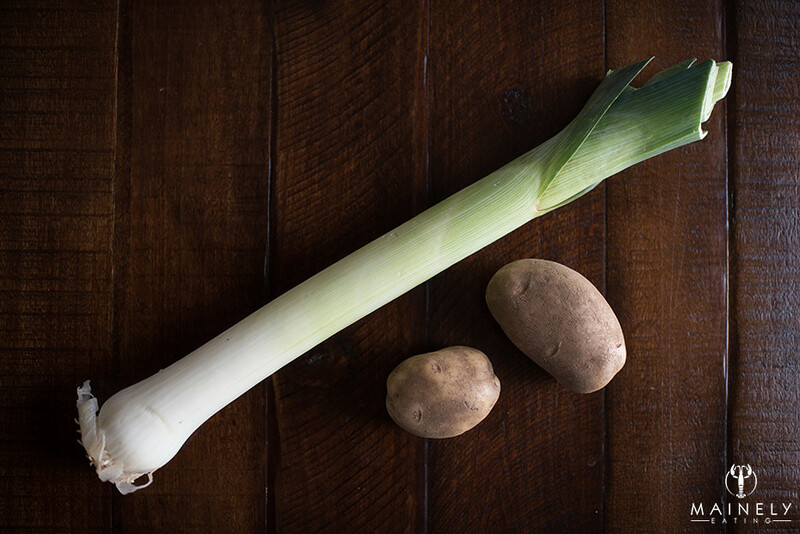 Maybe it’s due to the years I spent in Wales where the leek is a national symbol but I like to have the leeks as the star ingredient with the potato in more of a supporting role. It’s tough to specify quantities unless you plan to weigh out your vegetables. Depending on the time of year and where you’re getting your leeks from they could be little spindly baby leeks or whopping great tree-trunk leeks. I like to aim for 70-80% leek and 20% potato in the pot. The most recent batch I made used FIVE of this rather massive leeks and four small/medium potatoes for six steaming hot bowls of leek and potato deliciousness. Leeks are dirty little things, as you’d expect when they spend much of their life in the soil. To thoroughly wash them and remove all dirt you can slice them in half lengthwise (discard the very tough green tops) and then slice. That gives you half moon slices instead of rounds so you can clean better in between the layers. Cooking the leeks and potato with a little knob of butter, salt and pepper brings out the flavor. Then add your choice of liquid, water works fine or you might choose chicken stock or vegetable broth for the extra flavor. You want to just cover the leeks and potato as they’ll cook down quite a bit, you can always add a little more liquid once you’ve blended if you think your soup is too thick. 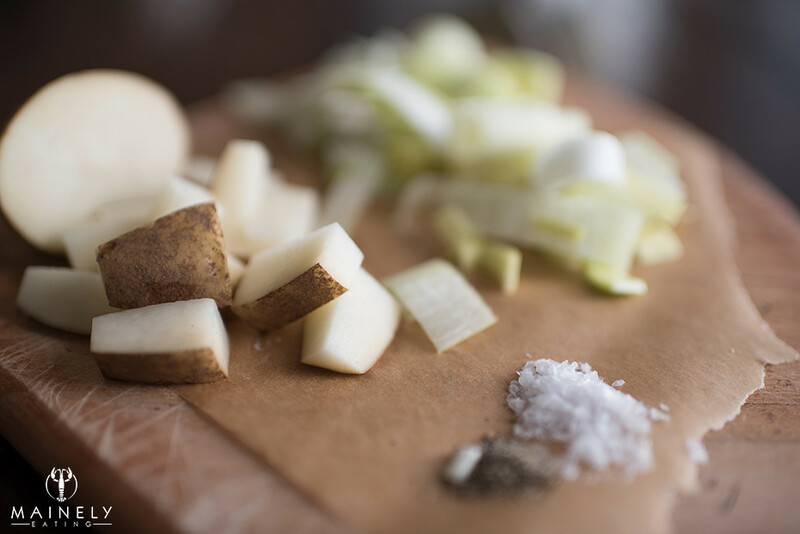 Pop a lid on and cook on a low/medium heat until the leeks are tender and the potato is easily pierced with the tip of a knife. If you plan to liquidize the soup in a blender you’ll have to wait for it to cool to avoid any hot soup explosions so I prefer my handheld blender. Give the soup a good blitz until there are no chunks left. Next comes the good stuff – stir in a cup of heavy cream. Season to taste, my preference is for heavy pepper and just enough salt to bring out the flavor of the leeks. 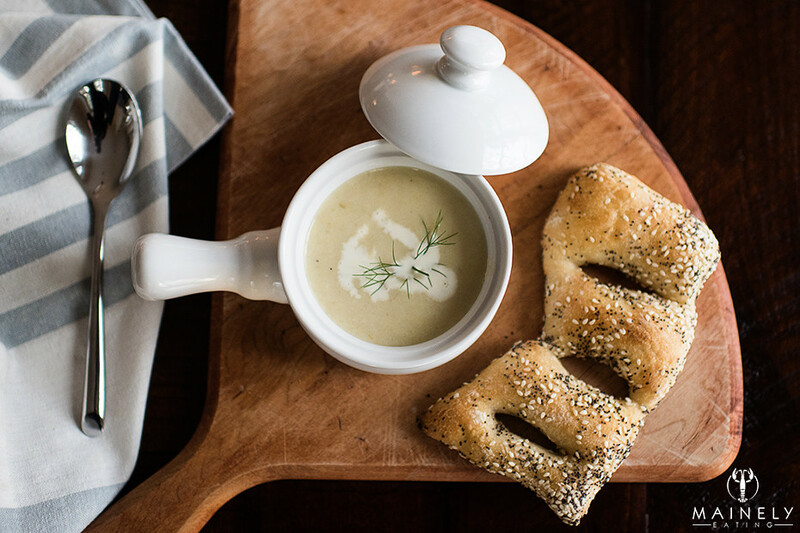 We enjoyed our soup with a crusty Fougasse bread roll from the amazing Standard Baking Company on the side. You can also drizzle in a little extra cream over the back of a teaspoon to dress up your soup if you feel the urge! This entry was posted in Home cooking, Lunch, Soup, Uncategorized by Mainely Eating. Bookmark the permalink.